Prices for international moving to Thailand may vary greatly. That is why it is important to compare quotes from international moving companies in your area. Since 2004 we helped more than 200.000 expats find an international removalist. Some saved up to 40% on their move overseas. Use our free, non-obligatory service to request free quotes. 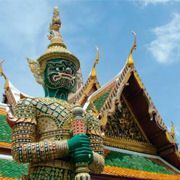 We select up to 5 international removalists to Thailand to send you a quote. Let us help you to save time and money! We are UK’s specialists on Moving to Thailand. Our unique moving quote service gets you 5 free removal quotes from international moving companies. Specialised in relocating to Thailand. You receive an email with contact details of the international relocators we have selected for you. Also for shipping furniture or shipping personal belongings to Thailand you are at the right place. Request your free quotes now and save on your international move!